LOS ANGELES: Samsung has hit back at critics who said it shoe-horned its way into the most shared tweet of all time, countering that Ellen DeGeneres "organically" incorporated the brand into her Oscars selfie. Samsung was a sponsor at the Academy Awards this year. The brand said in a statement sent to TechCrunch that it will donate $1.5 million to two charities of DeGeneres' choice in "honor of this epic moment." "While we were a sponsor of the Oscars and had an integration with ABC, we were delighted to see [DeGeneres] incorporate the device into the selfie moment that had everyone talking," a spokesperson for the brand said. "A great surprise for everyone, she captured something that nobody expected. In honor of this epic moment and, of course, the incredible response of nearly 3 million retweets, we wanted to make a donation to Ellen's charities of choice: St. Jude's and the Humane Society [of the United States]." Samsung said it will donate $1.5 million to each charity. After DeGeneres' TV show on Monday, she promoted an additional tie-in with Samsung, and tweeted: "I gave everyone in my audience a @SamsungMobileUS Galaxy Note 3. Anyone else want one?" with a link to a competition page. The Oscar selfie is the most retweeted post of all time, smashing through President Barack Obama's "four more years" tweet that was posted after he won reelection in November 2012. It held the previous record at 781,826 retweets. 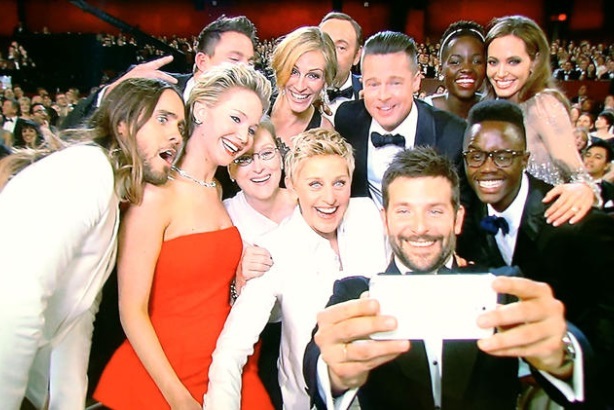 The record-breaking selfie was taken by Bradley Cooper and featured a plethora of Hollywood stars, from DeGeneres herself to Jennifer Lawrence, Meryl Streep, Jared Leto, Brad Pitt, Angelina Jolie, Channing Tatum, Julia Roberts, Kevin Spacey, Lupita Nyong'o, and her brother.